All-N-One elected its officers for 2019 from top left to bottom right, news reporter Mary Gerber, treasurer Peyton Johnson, historian Katy Kotlinski, secretary Abby Arledge, president Madison Johnson, vice president Hidy Kirkpatrick, safety officer Alora Self, health officer Karlee Johnson, environmental officer Leah Marine and community service officer Logan Payton. 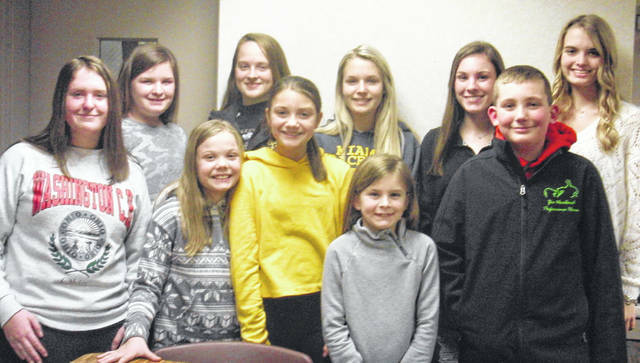 The All-N-One 4-H club held its first meeting for 2019 on Jan. 8 at 7 p.m. at the Kroger’s conference room. Madison Johnson called the meeting to order. Abby Arledge led the Pledge of Allegiance and Peyton Johnson led the 4-H pledge. Molly Mickle welcomed all new and old members to the meeting. There were no minutes from the last meeting. We elected new officers: president-Madison Johnson, vice president-Hidy Kirkpatrick, secretary-Abby Arledge, treasurer-Peyton Johnson, news reporter-Mary Gerber, health-Karlee Johnson, safety- Alora Self, community service- Logan Payton, environmental-Leah Marine, and historian-Katy Kotlinski. We passed out project books and enrollment forms that are due back ASAP and a tentative schedule of events for the club. Proposed two items to the club, they were voted on and passed: providing horses and food for the FFA judging (fundraiser) and 4-H constitution and All-N-One by-laws. Molly Mickle thanked everyone for their hard work last year in making the club a Gold Club, thanked Kroger for the use of their conference room, and reminded everyone they need to do a demonstration. The Fayette County Fair will take place July 15-20. Present were 16 4-H members, six cloverbuds, two advisors and 15 parents, totaling 39. All-N-One will hold its next meeting on Jan. 22 at 7 p.m. at the Kroger conference room. https://www.recordherald.com/wp-content/uploads/sites/27/2019/01/web1_AllinOne.jpgAll-N-One elected its officers for 2019 from top left to bottom right, news reporter Mary Gerber, treasurer Peyton Johnson, historian Katy Kotlinski, secretary Abby Arledge, president Madison Johnson, vice president Hidy Kirkpatrick, safety officer Alora Self, health officer Karlee Johnson, environmental officer Leah Marine and community service officer Logan Payton.